Poppy’s champion update’s been on the list since before there even was a list. 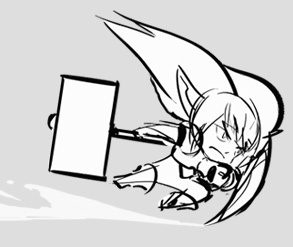 With the Keeper of the Hammer making her debut on PBE, read the story of how it came together. What would a hero be like if they had all of the strength, courage, and potential of legend, but no idea of it? We started exploring Poppy more than a year ago. With her outdated visuals and awkward, imbalanced kit, she’s long been a candidate for a champion update, but getting it right meant expanding on the limited things we knew about her (she had fewer than twenty lines in game) while finding a new gameplay design that would fit with her character and satisfy fans of the little-yordle-that-could. Poppy’s the Demacian yordle. That was clear from the beginning. But as a champion proud and loud about her love for Demacia, it was important to keep her from seeming like a mini-Garen. So while she can fangirl for Garen and kneel to Jarvan IV, she has to stand out as her own yordle. Demacian in her own way. The solution we arrived at was embracing the notion of an unaware hero. She was given a legendary weapon and tasked with finding the hero worthy of wielding it. She’s an answer to the question, what would a hero be like if they had all of the strength, courage, and potential of legend, but no idea of it? 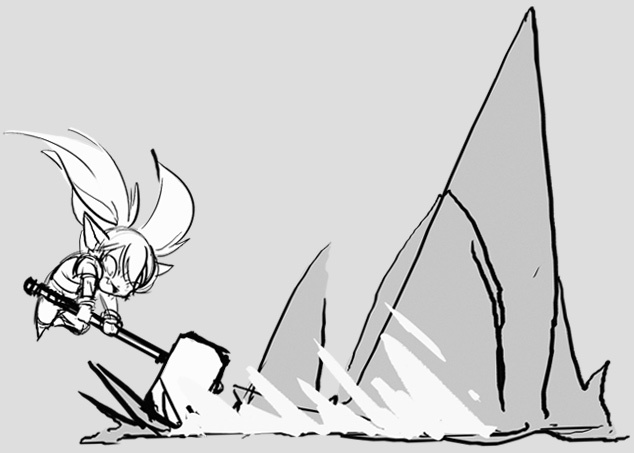 Poppy’s the underdog, even when she’s packing the biggest hammer in the fight. Poppy’s a walking contradiction. Small, but unbelievably tanky. First into the fray, but last to believe in herself. She’s earnest to the point where you can’t quite trust her, but honest to the extreme that you know you have to. 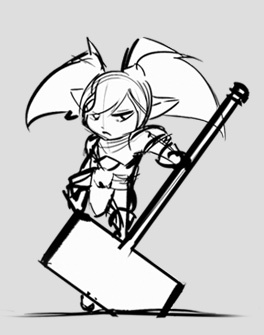 Hammering home her personality keeps her identity distinct among the yordles, while showing off an alternate take on the traditional Demacian warrior. Whether defending a small village besieged by a nefarious dragon, or a sidelane squishy under assault by a gank-hungry jungler, Poppy’s coming to save the day. She just might apologize afterwards. Balancing the contradiction inherent in her character and then expressing it through gameplay, art, and story proved a unique challenge. At the same time we were puzzling out how to really put the hammer down in terms of her story, it was our chance to figure out how Poppy should look. Some champs are dark and grim like Thresh or horrifying like Hecarim. And others have a snaggletooth. Unlike a champ like Sion, Poppy’s in-game visuals were outdated, but not far off from the way a yordle decked out in Demacian dress would appear. The one thing that really stood out was the hammer. Her story, gameplay, and art all center around her weapon, but it wasn’t always the biggest thing about her. So we re-rolled the drop. 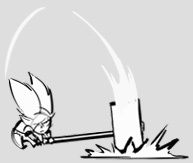 Now her hammer is twice the size of the diminutive yordle, representing the burden of her quest to find the hero of legend and the power she packs into a small frame. To show off those unique sides of her that make her different from other Demacians (and yordles), we’ve played up the extremes of her personality in art and in-game visuals as well as the story and gameplay: she’s introspective and full of doubts but also eager and full of energy. She shoulders the burden of her quest with pluck and courage, but her humility leaves her with a glaring blind spot. She can’t see that she might be the Demacian hero she’s been seeking the whole time. She shoulders the burden of her quest with pluck and courage, but her humility leaves her with a glaring blind spot. No part of a champion update happens in a vacuum, and while we explored different storytelling and visual possibilities for a pint-sized brawler, we were also experimenting with gameplay kits. When we first brought Poppy into the ol’ update workshop, we had to deal with one of the most powerful, but least compelling abilities in the game. Poppy’s old ultimate, Diplomatic Immunity, could render her immune from damage and crowd control from everything that wasn’t trapped in a glowing gold cylinder of sadness. Diplomatic Immunity defined her kit, and pushed her play pattern towards “assassinate the backline with absurd damage out of nowhere.” That squishy-squasher style didn’t make sense given Poppy’s original story or the direction we were taking her, and Diplomatic Immunity was so powerful, Poppy’s entire kit had to be limited because of it. After initial explorations, it became clear that straight up nerfing Diplomatic Immunity meant losing what made the ability cool and unique. Once we made the decision to remove it instead, we could play around with new signature abilities to anchor the kit around. After trying a few different themes, we circled back to her story and focused on one aspect of her character in particular--disproportionate power--which led to her new ultimate. 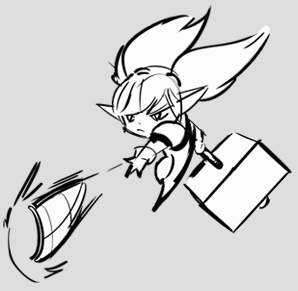 With the exaggerated hammer slap of Keeper’s Verdict in place, we found we were able to really push Poppy’s strategic niche of tanky disruption to eleven. We’re looking forward to bringing her back to the battlefield packing a whole new wallop. 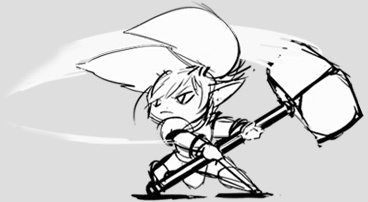 Poppy’s new unique gameplay identity embraces her small-stature/big-hammer duality. Despite being one of the smallest champions in the game, she brings a ton of crowd control that’s perfect both for causing commotion in a big scrum and flattening bad guys one-on-one. Through her art, gameplay, and story, we’ve refined the core of Poppy’s personality and playstyle while discovering a few things, too. She’s on PBE now, but we’re looking forward to bringing her back to the battlefield packing a whole new wallop.